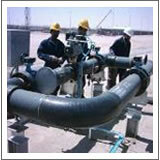 We undertake Annual Maintenance Contract (AMC) of various industrial systems & Equipments. Our specialty Operation services assures peace of mind and least down time of by 24X7 deputation of our trained technicians for day to day operation & moni-toring of various industrial systems & Equipments at site. We have trained man power to undertake opera-tions on immediate basis for Air Cooled Condensers, Water and Waste Water Treatment Plants, Material Handling Systems, Heavy, Petrol, CNG & LPG despising Units. Our breakdown support team is trained to undertake multiple tasks to execute on site repair and extend emergency support re-spective of type of equipment or systems with minimum supervision. Although India is known as most populated country but no matter what is the size of company or industry dearth qualified, em-ployable & efficient manpower is the big-gest constraint; to over come this con-straints our Automation Solutions team is ready to extend support. We provide Automation Solutions for vari-ous industries like Food Processing Units, Meat and Poultry Procession Units, Hazardous material handling systems, Hot Metal (Solid & Liquid) handling & Transport, Material Handling, Pick & Place Systems of Store Houses and Production Units..